What’s greater than an Alligator? In math resource land there has been a controversy this year: to gimmick or not to gimmick. It is pretty obvious where I stand on this issue -I LOVE GIMMICKS. Well, actually, I love gimmicks for people who love gimmicks. For people who don’t not like gimmicks, please do not use them! Life is short, let’s not waste anyone’s time. The issue that started this controversy was the Alligator trick. Just know now, that I LOVE the alligator trick! At one point I even considered throwing an alligator into King David’s moat. 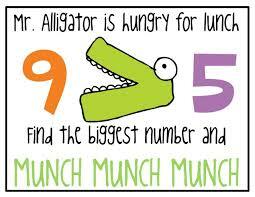 The alligator eats the biggest number- easy! Alligators are greedy that makes total sense. Personally, it is much more forthright than the “trick” of counting one dot at the corner and 2 dots at the tips of the lines and then comparing the two numbers. That helpful hint does not work for the way my brain is wired. It requires me to think LONGER and brings me no joy. Some people will argue that the purpose of math is not to bring JOY. Well, I respectfully disagree. We are all wired differently, that’s what makes the world so interesting. As teachers and facilitators it is our job to find what works for each child with love and joy. Research now supports that PLAY helps retain information and solidify understanding. So PLAY with your math!